Carefree, Arizona is the only place where you can find Ho Hum Drive and Easy Street! The Town of Carefree was incorporated in 1984. In downtown Carefree you'll find the Post Office, the famous Sundial, Town Hall, the Municipal Court, and the Cave Creek-Carefree Chamber of Commerce. This is also the location for the annual Carefree Art & Wine Festival and the Carefree Christmas Festival. While those are seasonal events, you can always visit carefree for local charm, shops, and cafes as well as the Carefree Desert Garden right near the Sundial. There's no mall and no movie theaters in Carefree. You can browse a few galleries and shops nearby at el Pedregal, where there are also occasional concerts outside. There are two resorts in Carefree. The Carefree Resort & Conference Center is a smaller, quieter resort, while the highly acclaimed Boulders Resort & Spa is more upscale (and more expensive) with a championship golf course and fine dining. Carefree makes a lovely spot, outside of the city hustle and bustle, for a weekend local staycation without the hassle of travel! 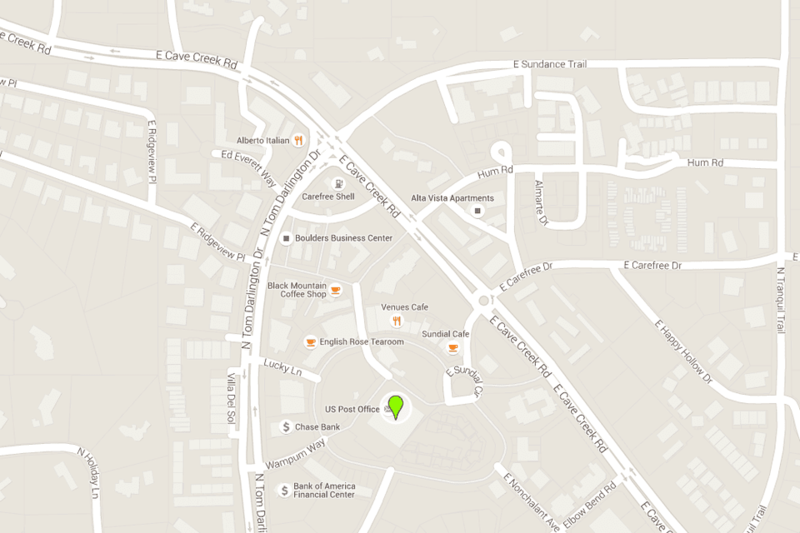 For the purposes of this map, the address used for downtown Carefree, AZ is 100 Easy Street, Carefree, AZ 85377. METRO Light Rail does not serve Carefree, nor does the Valley Metro bus system. From West Phoenix: Drive north on I-17 (Black Canyon Freeway) to Carefree Hwy. Turn right (east) to Tom Darlington Road. Turn left (north) and north for about 1-1/2 miles. From Central and East Phoenix: Drive north on SR51 to the Loop 101 east, toward Scottsdale. Exit Scottsdale Road and drive north. Past Carefree Highway it becomes Tom Darlington Road. Continue north on Tom Darlington Rd. for about 1-1/2 miles. From Scottsdale: Take the Loop 101 to Scottsdale Road. Turn right (north) upon exiting and drive past Carefree Highway. It becomes Tom Darlington Road. Continue north on Tom Darlington Rd. for about 1-1/2 miles. Visiting Cave Creek, Arizona? Here's How to Get There.